For other uses, see St. Denis' Church (disambiguation). 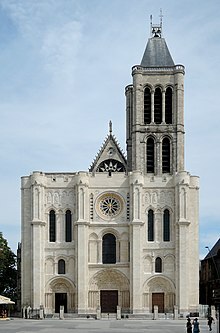 The Basilica of Saint-Denis (French: Basilique royale de Saint-Denis, or simply Basilique Saint-Denis) is a large medieval abbey church in the city of Saint-Denis, now a northern suburb of Paris. The building is of singular importance historically and architecturally as its choir, completed in 1144, shows the first use of all of the elements of Gothic architecture. The site originated as a Gallo-Roman cemetery in late Roman times. The archeological remains still lie beneath the cathedral; the people buried there seem to have had a faith that was a mix of Christian and pre-Christian beliefs and practices. Around 475 St. Genevieve purchased some land and built Saint-Denys de la Chapelle. In 636 on the orders of Dagobert I the relics of Saint Denis, a patron saint of France, were reinterred in the basilica. 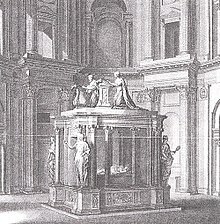 The relics of St-Denis, which had been transferred to the parish church of the town in 1795, were brought back again to the abbey in 1819. The basilica became a place of pilgrimage and the burial place of the French Kings with nearly every king from the 10th to the 18th centuries being buried there, as well as many from previous centuries. (It was not used for the coronations of kings, that function being reserved for the Cathedral of Reims; however, French Queens were commonly crowned there.) "Saint-Denis" soon became the abbey church of a growing monastic complex. In the 12th century the Abbot Suger rebuilt portions of the abbey church using innovative structural and decorative features. In doing so, he is said to have created the first truly Gothic building. The basilica's 13th-century nave is the prototype for the Rayonnant Gothic style, and provided an architectural model for many medieval cathedrals and abbeys of northern France, Germany, England and a great many other countries. The abbey church became a cathedral in 1966 and is the seat of the Bishop of Saint-Denis, Pascal Michel Ghislain Delannoy. Although known as the "Basilica of St Denis", the cathedral has not been granted the title of Minor Basilica by the Vatican. Saint Denis, a patron saint of France, became the first bishop of Paris. He was decapitated on the hill of Montmartre in the mid-third century with two of his followers, and is said to have subsequently carried his head to the site of the current church, indicating where he wanted to be buried. A martyrium was erected on the site of his grave, which became a famous place of pilgrimage during the fifth and sixth centuries. Above all, Eligius fabricated a mausoleum for the holy martyr Denis in the city of Paris with a wonderful marble ciborium over it marvelously decorated with gold and gems. He composed a crest [at the top of a tomb] and a magnificent frontal and surrounded the throne of the altar with golden axes in a circle. He placed golden apples there, round and jeweled. He made a pulpit and a gate of silver and a roof for the throne of the altar on silver axes. He made a covering in the place before the tomb and fabricated an outside altar at the feet of the holy martyr. So much industry did he lavish there, at the king's request, and poured out so much that scarcely a single ornament was left in Gaul and it is the greatest wonder of all to this very day. None of this work survives. The north transept rose features the Tree of Jesse. The south transept rose shows the Creation. The Basilica of St Denis ranks as an architectural landmark—as the first major structure of which a substantial part was designed and built in the Gothic style. Both stylistically and structurally, it heralded the change from Romanesque architecture to Gothic architecture. Before the term "Gothic" came into common use, it was known as the "French Style" (Opus Francigenum). As it now stands, the church is a large cruciform building of "basilica" form; that is, it has a central nave with lower aisles and clerestory windows. It has an additional aisle on the northern side formed of a row of chapels. The west front has three portals, a rose window and one tower, on the southern side. The eastern end, which is built over a crypt, is apsidal, surrounded by an ambulatory and a chevet of nine radiating chapels. The basilica retains stained glass of many periods (although most of the panels from Suger's time have been removed for long-term conservation and replaced with photographic transparencies), including exceptional modern glass, and a set of twelve misericords. The basilica measures 108 meters long, and its width is 39 meters. Little is known about the earliest buildings on the site. The first church mentioned in the chronicles was begun in 754 under Pepin the Short and completed under Charlemagne, who was present at its consecration in 775. By 832 the Abbey had been granted a remunerative whaling concession on the Cotentin Peninsula. Most of what is now known about the Carolingian church at St Denis resulted from a lengthy series of excavations begun under the American art historian Sumner McKnight Crosby in 1937. The building was about 60m long, with a monumental westwork, single transepts, a crossing tower and a lengthy eastern apse over a large crypt (parts of which survive). According to one of the Abbey's many foundation myths a leper, who was sleeping in the nearly completed church the night before its planned consecration, witnessed a blaze of light from which Christ, accompanied by St Denis and a host of angels, emerged to conduct the consecration ceremony himself. Before leaving, Christ healed the leper, tearing off his diseased skin to reveal a perfect complexion underneath. A misshapen patch on a marble column was said to be the leper's former skin, which stuck there when Christ discarded it. Having been consecrated by Christ, the fabric of the building was itself regarded as sacred. ...on special days such as the feast of the blessed Denis [...] when the narrowness of the place forced women to run to the altar on the heads of men as on a pavement with great anguish and confusion. Suger's fascination with light was not merely aesthetic. Like many French clerics in the 12th century AD, he was a follower of Pseudo-Dionysius the Areopagite, a 6th-century mystic who equated the slightest reflection or glint with divine light. When renovated, the Saint-Denis basilica included Suger's own words carved in the nave: "For bright is that which is brightly coupled with the bright/and bright is the noble edifice which is pervaded by the new light." It is important to emphasise that Suger was the patron of the rebuilding of St Denis but not the architect, as was often assumed in the 19th and early 20th centuries. In fact it appears that two distinct architects, or master masons, were involved in the 12th-century changes. Both remain anonymous but their work can be distinguished on stylistic grounds. The first, who was responsible for the initial work at the western end, favoured conventional Romanesque capitals and moulding profiles with rich and individualised detailing. His successor, who completed the western facade and upper stories of the narthex, before going on to build the new choir, displayed a more restrained approach to decorative effects, relying on a simple repertoire of motifs, which may have proved more suitable for the lighter Gothic style that he helped to create. Suger began his rebuilding project at the western end of St Denis, demolishing the old Carolingian westwork, with its single, centrally located door. He extended the old nave westwards by an additional four bays and added a massive western narthex, incorporating a new façade and three chapels on the first floor level. This new façade, 34 metres (112 ft) wide and 20 metres (66 ft) deep, has three portals, the central one larger than those either side, reflecting the relative width of the central nave and lateral aisles. This tripartite arrangement was clearly influenced by the late 11th-century façades of the abbey churches of St Etienne and La Trinité, Caen, with which it also shared a three-story elevation and flanking towers. Only the south tower survives; the north tower was dismantled following a tornado which struck in 1846. The major innovation in the façade at St Denis is the way the unknown architects have chosen to emphasise the divisions between the different parts with massive vertical buttresses separating the three doorways and horizontal string-courses and window arcades clearly marking out the divisions. This clear delineation of parts was to influence subsequent west façade designs as a common theme in the development of Gothic architecture and a marked departure from the Romanesque. The rose window at the centre of the upper story of the west portal was also innovative and influential. 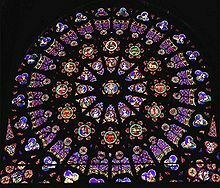 Although small circular windows (oculi) within triangular tympana were common on the west facades of Italian Romanesque churches, this was probably the first example of a rose window within a square frame, which was to become a dominant feature of the Gothic facades of northern France (soon to be imitated at Chartres Cathedral and many others). The overall design of the façade has an obvious resemblance to a Roman city gatehouse (an impression strengthened by the buttresses and by the crenellations around the top), which helps to emphasise the traditional notion of great churches as earthly embodiments of the Heavenly City, as described in the Book of Ezekiel. The tympanum of the portal of the north transept depicts the martyrdom of St Denis. For the glory of the church which nurtured and raised him, Suger strove for the glory of the church, Sharing with you what is yours, oh martyr Denis. He prays that by your prayers he should become a sharer in Paradise. The year when it was consecrated was the one thousand, one hundred and fortieth year of the Word. Receive, stern Judge, the prayers of your Suger, Let me be mercifully numbered among your sheep. Suger's western extension was completed in 1140 and the three new chapels in the narthex were consecrated on 9 June of that year. On completion of the west front, Abbot Suger moved on to the reconstruction of the eastern end, leaving the Carolingian nave in use. He wanted a choir (chancel) that would be suffused with light. To achieve his aims, Suger's masons drew on the several new elements which evolved or had been introduced to Romanesque architecture: the pointed arch, the rib vault, the ambulatory with radiating chapels, the clustered columns supporting ribs springing in different directions and the flying buttresses which enabled the insertion of large clerestory windows. It was the first time that these features had all been drawn together, and the style evolved radically from the previous Romanesque architecture by the lightness of the structure and the unusually large size of the stained glass windows. Erwin Panofsky argued that Suger was inspired to create a physical representation of the Heavenly Jerusalem; however, the extent to which Suger had any aims higher than aesthetic pleasure has been called into doubt by more recent art historians on the basis of Suger's own writings. The new structure was finished and dedicated on 11 June 1144, in the presence of the King. The Abbey of St Denis thus became the prototype for further building in the royal domain of northern France. Through the rule of the Angevin dynasty, the style was introduced to England and spread throughout France, the Low Countries, Germany, Spain, northern Italy and Sicily. The glazed triforium of Saint-Denis is a notable feature of Rayonnant Gothic. In 1231, Abbot Odo Clement began work on the rebuilding of the Carolingian nave, which remained sandwiched incongruously between Suger's Gothic works to the east and west. Both the nave and the upper parts of Suger's choir were replaced in the Rayonnant Gothic style. From the start it appears that Abbot Odo, with the approval of the Regent Blanche of Castile and her son, the young King Louis IX, planned for the new nave and its large crossing to have a much clearer focus as the French 'royal necropolis'. That plan was fulfilled in 1264 when the bones of 16 former kings and queens were relocated to new tombs arranged around the crossing, 8 Carolingian monarchs to the south and 8 Capetians to the north. These tombs, featuring lifelike carved recumbent effigies or gisants lying on raised bases, were badly damaged during the French revolution though all but two were subsequently restored by Viollet le Duc in 1860. The dark Romanesque nave, with its thick walls and small window-openings, was rebuilt using the very latest techniques, in what is now known as Rayonnant Gothic. This new style, which differed from Suger's earlier works as much as they had differed from their Romanesque precursors, reduced the wall area to an absolute minimum. Solid masonry was replaced with vast window openings filled with brilliant stained glass (all destroyed in the Revolution) and interrupted only by the most slender of bar tracery—not only in the clerestory but also, perhaps for the first time, in the normally dark triforium level. The upper facades of the two much-enlarged transepts were filled with two spectacular 12m-wide rose windows. As with Suger's earlier rebuilding work, the identity of the architect or master mason remains unknown. Although often attributed to Pierre de Montreuil, the only evidence for his involvement is an unrelated document of 1247 which refers to him as 'a mason from Saint-Denis'. A plan of circa 1700 by Félibien shows the Valois Chapel, a large mortuary chapel in the form of a domed colonnaded "rotunda", adjoining the north transept of the basilica and containing the tomb of the Valois. Due to its connections to the French monarchy and proximity to Paris, the abbey of Saint-Denis was a prime target of revolutionary vandalism. The medieval monastic buildings were demolished in 1792. Although the church itself was left standing, its was deconsecrated, its treasury confiscated and its reliquaries and liturgical furniture melted down for their metallic value (although some objects, including a chalice and aquamanile donated to the abbey in Suger’s time, were successfully hidden and survive to this day) and the royal tombs desecrated. The jamb figures of the façade representing Old Testament royalty, mistakenly identified as images of royal French kings and queens, were removed from the portals and the tympana sculpture defaced. The tombs and effigies were relocated to the Musée des Monuments Français by Alexandre Lenoir in 1798. The church was reconsecrated by Napoléon in 1806 and the tomb sculptures returned to Saint-Denis after the restoration of the monarchy. The church, including the architectural sculpture and stained glass windows (of which very little medieval glass survives) was heavily restored in the mid-nineteenth century by Eugène Viollet-le-Duc, the same architect responsible for the restoration of the Cathedral of Notre-Dame. The present location of the tomb effigies does not correspond to their medieval locations. In the early 1840s, cracks appeared in the north tower's masonry following several extreme weather events. A violent storm on 19 August 1845, notable for spawning a tornado, proved critical, and the tower's walls were soon found to have flexed and become dangerously unstable. With François Debret's reconstructive works, carried out after an 1837 lightning strike, proving inadequate, in February 1846 the authorities decided to "temporarily" dismantle the north tower to avoid a catastrophic collapse, with the stones stored for later reconstruction. In December 2016, 170 years after the North Towers dismantlement and following several false starts, the Ministry of Culture again proposed its reconstruction after concluding it was technically feasible—albeit without public funding. An association, Suivez la flèche ("Follow the Spire"), chaired by Patrick Braouezec, has since been established to support the reconstruction, with the aim of raising the necessary funds by opening the reconstruction works to the general public, along the model of the Guédelon Castle. In March 2018 the culture ministry signed an accord with the association, officially launching the reconstruction project, with works expected to commence in the spring of 2019. The abbey is where the kings of France and their families were buried for centuries and is therefore often referred to as the "royal necropolis of France". All but three of the monarchs of France from the 10th century until 1789 have their remains here. Some monarchs, like Clovis I (465–511), were not originally buried at this site. The remains of Clovis I were exhumed from the despoiled Abbey of St Genevieve which he founded. The abbey church contains some fine examples of cadaver tombs. The effigies of many of the kings and queens are on their tombs, but their bodies were removed during the French Revolution. The ancient monarchs were removed in August 1793 to celebrate the revolutionary Festival of Reunion, then the Bourbon and Valois monarchs were removed to celebrate the execution of Marie Antoinette in October 1793. The bodies were dumped into three trenches and covered with lime to destroy them. Archaeologist Alexandre Lenoir saved many of the monuments by claiming them as artworks for his Museum of French Monuments. The bodies of several Plantagenet monarchs of England were likewise removed from Fontevraud Abbey during the French Revolution. Napoleon Bonaparte reopened the church in 1806, but left the royal remains in their mass graves. In 1817 the restored Bourbons ordered the mass graves to be opened, but only portions of three bodies remained intact. The remaining bones from 158 bodies were collected into an ossuary in the crypt of the church, behind marble plates bearing their names. The bodies of the beheaded King Louis XVI, his wife Marie Antoinette of Austria, and his sister Madame Élisabeth were not initially buried in Saint-Denis, but rather in the churchyard of the Madeleine, where they were covered with quicklime. The body of the Dauphin, who died of an illness, was buried in an unmarked grave in a Parisian churchyard near the Temple. During Napoleon's exile in Elba, the restored Bourbons ordered a search for the corpses of Louis XVI and Marie Antoinette. The few remains, a few bones that were presumably the king's and a clump of greyish matter containing a lady's garter, were found on 21 January 1815, brought to Saint-Denis and buried in the new Bourbon crypt. King Louis XVIII, upon his death in 1824, was buried in the center of the crypt, near the graves of Louis XVI and Marie Antoinette. The coffins of royal family members who died between 1815 and 1830 were also placed in the vaults. Under the direction of architect Viollet-le-Duc, famous for his work on Notre-Dame de Paris, church monuments that had been taken to the Museum of French Monuments were returned to the church. The corpse of King Louis VII, who had been buried at Barbeau Abbey and whose tomb had not been touched by the revolutionaries, was brought to Saint-Denis and buried in the crypt. In 2004, the mummified heart of the Dauphin, the boy who would have been Louis XVII, was sealed into the wall of the crypt. The organ of the Basilica of Saint-Denis was the first organ built by Aristide Cavaillé-Coll in 1841, when he was 23 years old. It contains numerous innovations opening the romantic area, in particular the very first Barker lever. With 3 manuals and pedals, it is protected by the Monument historique label. It was restored in 1901 by Charles Mutin, and between 1983 and 1987 by Jean-Loup Boisseau and Bertrand Cattiaux. Pierre Pincemaille, unic titular organist during 30 years (between 1987 and 2018), set up lots of recitals (between 1989 and 1995, then between 2014 and 2017), and recorded 8 CDs with this instrument. The cathedral contains a huge church treasure, mainly constituted by the Abbot Suger. It contains crowns (Charlemagne, Saint Louis, Henry IV of France), cross and liturgic objects. Henri de La Tour d'Auvergne, Vicomte de Turenne (1611–1675), Maréchal General de France. Anne of Brittany, Duchess of Brittany (1477–1514), wife of Charles VIII and Louis XII. ^ Banister Fletcher, A History of Architecture on the Comparative Method. ^ "Birth of the Gothic: Abbot Suger and the Ambulatory at St. Denis". Smarthistory at Khan Academy. Retrieved December 18, 2012. ^ DeSmet, W.M.A. (1981). "Mammals in the Seas: General papers and large cetaceans. Whaling During the Middle Ages". ^ Bruce Watson, Light: A Radiant History from Creation to the Quantum Age. Bloomsbury, 2016, p 52. ^ William Chester Jordan, A Tale of Two Monasteries: Westminster and Saint-Denis in the thirteenth century (Princeton: Princeton University Press, 2009) Chapters 2–7. ^ "L'art Gothique", section: "L'architecture Gothique en Angleterre" by Ute Engel: L'Angleterre fut l'une des premieres régions à adopter, dans la deuxième moitié du XIIeme siècle, la nouvelle architecture gothique née en France. Les relations historiques entre les deux pays jouèrent un rôle prépondérant: en 1154, Henri II (1154–1189), de la dynastie Française des Plantagenêt, accéda au thrône d'Angleterre." (England was one of the first regions to adopt, during the first half of the 12th century, the new Gothic architecture born in France. Historic relationships between the two countries played a determining role: in 1154, Henry II (1154–1189), of the French Plantagenet dynasty, ascended to the throne of England). ^ "L'affaire de la tour nord : La querelle des anciens et des modernes". Basilique Cathédrale de Saint-Denis (in French). Seine-Saint-Denis Tourisme. Retrieved 26 September 2018. ^ Bourdon, Gwenaël (30 January 2017). "Basilique Saint-Denis : le chantier de la flèche freiné dans son élan". Le Parisien (in French). Retrieved 26 September 2018. ^ "Accord définitif de l'Etat : la flèche de la Basilique sera remontée". Basilique Cathédrale de Saint-Denis (in French). Seine-Saint-Denis Tourisme. Retrieved 26 September 2018. ^ "Basilique Cathédrale de Saint-Denis". Centre des Monuments Nationaux. Come and visit the Basilica Cathedral of Saint Denis near Paris, the first monumental masterpiece of Gothic art. Discover the Royal necropolis and its collection of 70 sculpted recumbent statues – the only set of its kind in Europe – bathed in the multi-coloured light of the 12th and 19th-century stained glass windows. ^ a b Lindsay, Suzanne Glover. "The Revolutionary Exhumations at St-Denis, 1793". Center for the Study of Material & Visual Cultures of Religion. Yale University. ^ Knecht, 227. Henry's gesture is now unclear, since a missal, resting on a prie-dieu (prayer desk), was removed from the sculpture during the French revolution and melted down. Félibien, Michel. 1973. Histoire de l'abbaye royale de Saint-Denys en France: Lettre-préf. de M. le Duc de Bauffremont. Introd. de Hervé Pinoteau. 1. [Nachdr. d. Ausg. Paris, 1706]. – 1973. – 524 S. Paris: Éd. du Palais Royal. Watson, Bruce, "Light: A Radiant History from Creation to the Quantum Age," (London and NY: Bloomsbury, 2016). Wikimedia Commons has media related to Basilique Saint-Denis and Tombs in Saint-Denis. Presentation of the organ of the Cathedral-Basilica of Saint-Denis by Pierre Pincemaille, titular organist on YouTube (in French) – With English subtitles.